The UN Environment-hosted Life Cycle Initiative is at the interface between users and experts of Life Cycle approaches. It provides a global forum to ensure a science-based, consensus-building process to support decisions and policies towards the shared vision of sustainability as a public good. The Life Cycle Initiative facilitates the application of life cycle knowledge in the global Sustainable Development agenda in order to achieve global goals faster and more efficiently. It delivers authoritative opinion on sound tools and approaches by engaging its multi-stakeholder partnership (including governments, businesses, scientific and civil society organizations). The target audiences for the Life Cycle Initiative include high-level decision makers (policy makers and regulators; business strategists) as well as LCA practitioners. The Initiative provides stewardship of the use of Life Cycle Knowledge in specific applications, and supports Life Cycle Assessment application through consensus on data and indicators. Who are our current Funding Partners? By 2022, the Life Cycle Initiative will train at least 2,500 policy makers, business decision makers and LCA practitioners, and share at least 20 Life Cycle Thinking success stories. 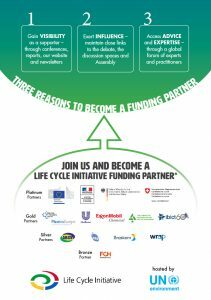 By 2022, the Life Cycle Initiative will, through partnerhsips, mainstream the use of Life Cycle Thinking into four global areas of decision and policy making, in at least 15 countries and 30 companies. Key partners include the One Planet network, the International Resource Panel, the Strategic Approach to International Chemicals Management (SAICM), SETAC, others. By 2022, the Life Cycle Initiative will offer a solution to access all LCA databases globally in an interoperable way, alongside a library of recommended impact assessment factors linked through a global nomenclature system. The following is an excerpt of information related to funding rules of the Life Cycle Initiative from the relevant sections of the Initiative’s Strategy Document and Governance. A sponsor of the Initiative provides funds towards achieving the vision and mission of the Life Cycle Initiative, and renounces to pursue any of its own goals through that funding unless these are aligned with those of the Initiative. Sponsors of the Initiative’s core funding are acknowledged in all communication materials. Sponsors of specific activities are explicitly acknowledged in the communication materials related to those activities funded. Sponsoring does not give any decision-making power to the sponsor, nor does it automatically provide a seat on any of the Initiative’s bodies. A sponsor of the Initiative cannot be funded to implement work for the Initiative. A member who fundraises for a specific project of the Initiative shall do so in collaboration with the Steering Committee, to ensure that the project proposal is fully aligned with the Initiative’s goals, and that the steering of the project is conducted by the Steering Committee and programme chairs. It is essential to ensure a transparent funding/spending structure, and provide firewalls between the different functions such as steering, coordinating, execution or review. For example, the UN Environment may participate simultaneously as member of Steering Committee, Secretariat and implementer, or a specific country or business may be a sponsor and in the Steering Committee. These situations are possible and clear rules are needed to avoid any perceived conflicts of interest impacting on the reputation and credibility of the Initiative. Specifically, a partner planning to become an implementing partner within the Life Cycle Initiative may not be elected as member of the Steering Committee, and a public or private sponsor that is in the Steering Committee does not have more decision making power than other elected Steering Committee members. All cash contributions to the Life Cycle Initiative are subject to deduction of UN Environment’s Programme Support Cost. In any case, reporting to the sponsors is always “as contribution to the overall progress of the Initiative towards its vision”. The core funding is needed to run the structure of the Initiative (Secretariat staff, travel, communication, evaluation and administration costs) as well as to have available (limited) budget to provide seed funding to get projects off the ground. All Initiative sponsors shall contribute to the core funding of the Initiative and shall be listed on the website and all communication materials. In addition to providing core funding to the Initiative, it is likely that some sponsors may want / only be able to fund specific programmatic elements directly. This may be done, for example, by earmarking a certain percentage of their contribution to a specific programme of the Initiative. The funds contributing to core funding must be at least 15% of the contribution or USD 25,000 per annum for any given sponsor – whichever is higher. Once the core budget is covered, all contributions are treated as programme funding. Programme funds are considered separately to core budget funds in the host’s accounts in order to provide a firewall between the coordinating and implementing roles. A partner may also “bring in” a project aligned with the Initiative’s programmes, funded through sources external to the Initiative. This kind of programme funding may be allowed and the result may be communicated as the output of the Initiative, as long as it is approved and governed by the Steering Committee as part of the Initiative’s programme of work (i.e. the steering of such projects need to be also linked with the steering of the Initiative). Such “external projects” should also provide some funds for the Initiative’s core funding following the minimum of USD 25,000 or 15% of overall budget – whichever is higher. Finally, direct funding by a sponsor to a specific activity of the Life Cycle Initiative (e.g. a workshop or publication) is possible, even without contribution to the core funding. In this case the sponsor is acknowledged in the communication materials linked to that specific activity, but is not considered a sponsor of the Initiative (i.e. it is not listed alongside Initiative sponsors in the website and general communication materials). This modality is considered useful mainly for one-off and high visibility activities requiring significant concentration of resources, which may attract sponsors not able to fund the Initiative overall or long term.